Former NBA star Earvin "Magic" Johnson is a huge fan of 70 metre motor yacht Amadeus. This summer Magic Johnson visited numerous destinations around the Med while on board. During his vacation celebrity guests, including actor Samuel L Jackson and Lewis Hamilton, joined him on Amadeus. Built in 2007 and refitted in 2014 Amadeus is full of surprises to keep charter guests entertained. She boasts a cinema, automated driving range, sauna and a Steinway grand piano. Amadeus can accommodate 12 guests and also has 19 crew. Amadeus is available to charter from €475,000 a week. Former NBA star Earvin "Magic" Johnson is a huge fan of 70 metre motor yacht Amadeus. This summer Magic Johnson visited numerous destinations around the Med while on board. During his vacation celebrity guests, including actor Samuel L Jackson and Lewis Hamilton, joined him on Amadeus. Built in 2007 and refitted in 2014 Amadeus is full of surprises to keep charter guests entertained. She boasts a cinema, automated driving range, sauna and a Steinway grand piano. Amadeus can accommodate 12 guests and also has 19 crew. Amadeus is available to charter from €475,000 a week. Roman Abramovich’s Eclipse is not openly available for charter but Russian rapper Timati managed to vacation on the yacht in August. He decided to share his advice on how to get invited on board Eclipse, which included promising not to break dishes or bring girls on board the yacht. The second largest yacht in the world 162.5 metre Eclipse was delivered by Blohm+Vossin 2010. Her accommodation includes an owner’s deck which is 56 metres long and has facilities for up to 92 crew and Abramovich’s personal staff. 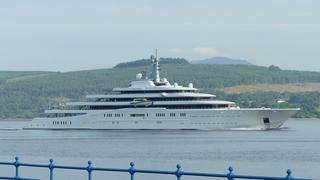 While Timati enjoyed the yacht's plentiful space in Ibiza, Roman Abramovich opted for a different vacation and Eclipse was spotted off of Greenock, Scotland in July. Roman Abramovich’s Eclipse is not openly available for charter but Russian rapper Timati managed to vacation on the yacht in August. He decided to share his advice on how to get invited on board Eclipse, which included promising not to break dishes or bring girls on board the yacht. The second largest yacht in the world 162.5 metre Eclipse was delivered by Blohm+Vossin 2010. Her accommodation includes an owner’s deck which is 56 metres long and has facilities for up to 92 crew and Abramovich’s personal staff. While Timati enjoyed the yacht's plentiful space in Ibiza, Roman Abramovich opted for a different vacation and Eclipse was spotted off of Greenock, Scotland in July. Pop star Beyoncé is no stranger to a luxury yacht charter and normally makes the most of her September birthday to enjoy some late summer sun in the Mediterranean. 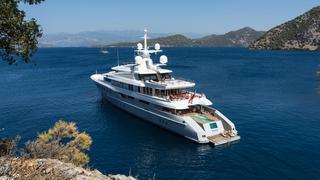 This year she opted to charter 65 metre Galactica Star, which she also vacationed on in 2013. Joined by a select group of family and friends, including former fellow Destiny's Child star Kelly Rowland, Beyoncé began her holiday relaxing in Capri. Galactica Star was delivered by Heesen in 2013 and was a multiple winner at the 2014 World Superyacht Awards. There are plenty of areas to relax on board as she features a two-deck beach club and glass-bottom swimming pool. Galactica Star’s Bannenberg & Rowell designed interior can accommodate 12 guests who will be looked after by 13 crew members. 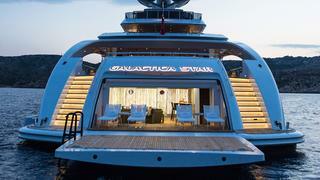 Galactica Star is not openly on the market for charter. Pop star Beyoncé is no stranger to a luxury yacht charter and normally makes the most of her September birthday to enjoy some late summer sun in the Mediterranean. 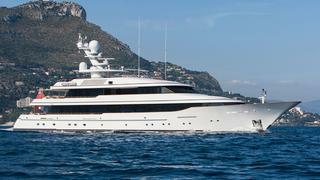 This year she opted to charter 65 metre Galactica Star, which she also vacationed on in 2013. Joined by a select group of family and friends, including former fellow Destiny's Child star Kelly Rowland, Beyoncé began her holiday relaxing in Capri. Galactica Star was delivered by Heesen in 2013 and was a multiple winner at the 2014 World Superyacht Awards. There are plenty of areas to relax on board as she features a two-deck beach club and glass-bottom swimming pool. Galactica Star’sBannenberg & Rowell designed interior can accommodate 12 guests who will be looked after by 13 crew members. Galactica Star is not openly on the market for charter. Actress Nina Dobrev spent time relaxing on board 43.28 metre L'Albatros with friends in St Tropez this summer. The actress gave her 5 million Instagram followers a taste of yacht life when she posted a video of herself sliding backwards down L'Albatros’s superyacht slide. Delivered in 1985 L'Albatros has undergone numerous refits, the latest of which was in 2014. The yacht offers accommodation for 12 guests in six cabins and, as well as her slide, also has a bathing platform, Jacuzzi and BBQ. L'Albatros charters for a weekly rate of €109,000 during high season in the Mediterranean. Actress Nina Dobrev spent time relaxing on board 43.28 metre L'Albatros with friends in St Tropez this summer. The actress gave her 5 million Instagram followers a taste of yacht life when she posted a video of herself sliding backwards down L'Albatros’ssuperyacht slide. Delivered in 1985 L'Albatros has undergone numerous refits, the latest of which was in 2014. The yacht offers accommodation for 12 guests in six cabins and, as well as her slide, also has a bathing platform, Jacuzzi and BBQ. L'Albatros charters for a weekly rate of €109,000 during high season in the Mediterranean. Supermodel Elle Macpherson is another celebrity that was spotted on a superyacht this summer. 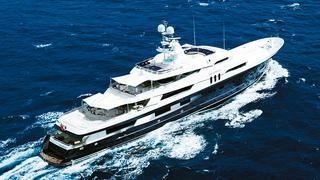 Her luxury yacht of choice is 55.5 metre Feadship Madsummer. Elle Macpherson’s Instragram posts showed her making full use of Madsummer’s extensive deck space, which includes a beautiful sundeck with a Jacuzzi. Delivered in 2005 with a refit in 2009 Madsummer can accommodate 10 guests in five rooms and has 14 crew. Madsummer is currently listed for sale by Moran Yacht & Ship. Supermodel Elle Macpherson is another celebrity that was spotted on a superyacht this summer. Her luxury yacht of choice is 55.5 metre FeadshipMadsummer. Elle Macpherson’s Instragram posts showed her making full use of Madsummer’s extensive deck space, which includes a beautiful sundeck with a Jacuzzi. Delivered in 2005 with a refit in 2009 Madsummer can accommodate 10 guests in five rooms and has 14 crew. Madsummer is currently listed for sale by Moran Yacht & Ship. Chelsea captain and former England international John Terry is no stranger to chartering a yacht and this summer he treated his family to a vacation on board O’Pati. 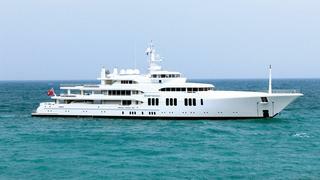 The 39.5 metre yacht was delivered by Golden Yachts in 2011 and is currently for sale. Her striking red and black colour scheme is one of the coolest yacht paint-jobs around and she stands out from the crowd wherever she goes. With a top speed of 32 knots she is also one of the fastest yachts available for charter. O-Pati is managed for charter by Atlanta Golden Yachts and has weekly charter rate of €108,000 during the high summer season. Chelsea captain and former England international John Terry is no stranger to chartering a yacht and this summer he treated his family to a vacation on board O’Pati. The 39.5 metre yacht was delivered by Golden Yachts in 2011 and is currently for sale. Her striking red and black colour scheme is one of the coolest yacht paint-jobs around and she stands out from the crowd wherever she goes. With a top speed of 32 knots she is also one of the fastest yachts available for charter. O-Pati is managed for charter by Atlanta Golden Yachts and has weekly charter rate of €108,000 during the high summer season. Model Chanel Iman has enjoyed multiple charters on board 85.95 metre Feadship Ecstasea. Chanel Iman has shared a host of snaps from her chic superyacht vacations in Formentera and Dubai. Ecstasea offers guests the opportunity to enjoy ultimate relaxation and luxury with dedicated massage room with a masseuse for treatments as well as a Jacuzzi and gym. Ecstasea also has an impressive range of toys including an anti-jellyfish sea pool, windsurfer, waterskis and a superyacht slide. Ecstasea is available to charter from €450,000 a week. Model Chanel Iman has enjoyed multiple charters on board 85.95 metre FeadshipEcstasea. Chanel Iman has shared a host of snaps from her chic superyacht vacations in Formentera and Dubai. Ecstasea offers guests the opportunity to enjoy ultimate relaxation and luxury with dedicated massage room with a masseuse for treatments as well as a Jacuzzi and gym. Ecstasea also has an impressive range of toys including an anti-jellyfish sea pool, windsurfer, waterskis and a superyacht slide. Ecstasea is available to charter from €450,000 a week. After taking in the party scene on a yacht at the Cannes Film Festival, Kendall Jenner, Gigi and Bella Hadid enjoyed a holiday on superyacht Axioma. More than 3,000 square metres of space spread across five decks means Axioma is a superyacht full of surprises. The yacht’s stunning atrium and infinity pool are just two reasons why celebrities love to charter Axioma. Axioma is managed for charter by Yachting Partners International and has a weekly charter rate of €525,000. After taking in the party scene on a yacht at the Cannes Film Festival, Kendall Jenner, Gigi and Bella Hadid enjoyed a holiday on superyacht Axioma. More than 3,000 square metres of space spread across five decks means Axioma is a superyacht full of surprises. The yacht’s stunning atrium and infinity pool are just two reasons why celebrities love to charter Axioma. Axioma is managed for charter by Yachting Partners International and has a weekly charter rate of €525,000.